I’ll admit that I find myself a bit stunned that the haunt season is nearly upon us once again, but boy am I excited. 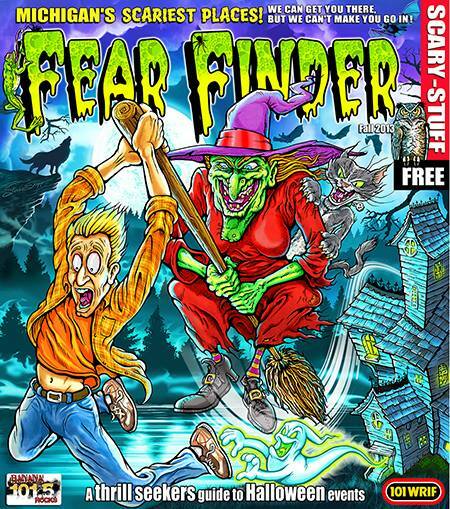 The cover art for the 2013 Fear Finder was released today with word that the celebrated annual newspaper will hit the streets, appropriately, on Friday the 13th! There’s a lot going on with this cover and I like it; that witch may be ugly but once upon a time she was rockin’ some serious knockers. There is a special sort of magic that comes with laying eyes on a new edition for the first time and I cannot wait to clutch it in my greedy fists this Friday!